The Artists of Palm Beach County and the Art on Park Gallery invite the public to the free, Opening Reception of “The Artist’s Mind” on Friday, February 22. Rickie Leiter was honored to be the juror for prizes! 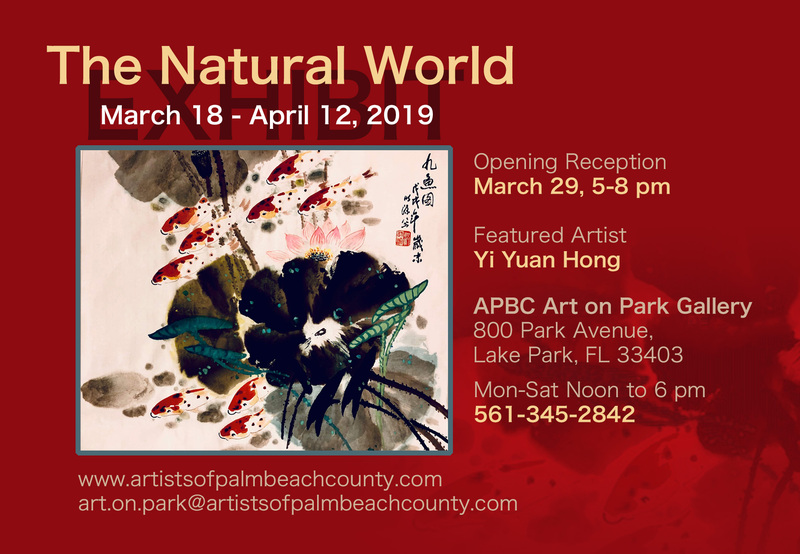 In addition, APBC and Art On Park Gallery are calling for an all media art exhibit, “The Natural World”. Entries are due March 6, with a Free, Public Opening Reception on Friday, March 22. This is open to members and non-members, with cash prizes. 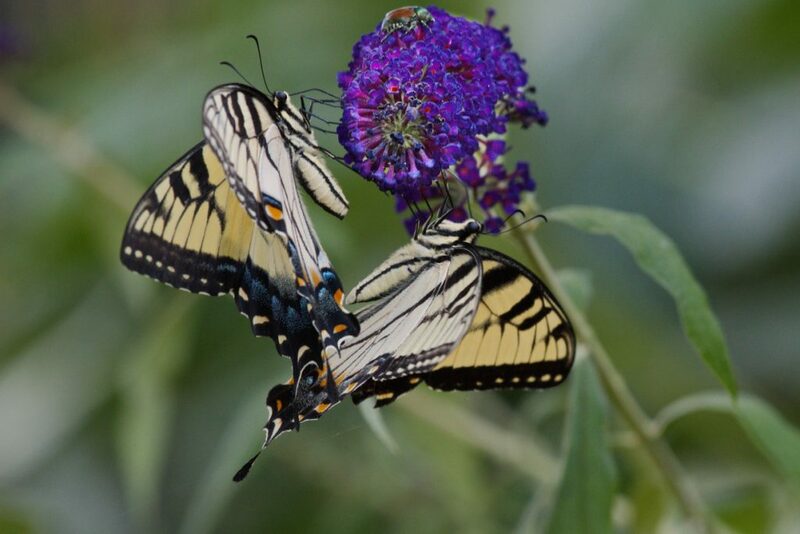 Show us what exemplifies your interpretation of the Natural World! The Rickie Report shares the details here. “THE NATURAL WORLD” is a call to artists both APBC members and non-members alike for an exhibit of original work of any subject, 2D and 3D welcomed in all media including ceramic, drawing, fiber/textile, glass, jewelry, mixed media, metal, oil, pastel, acrylic, photography, printmaking, watercolor, and wood. People find sustenance and solace, challenge and mystery in the natural world. 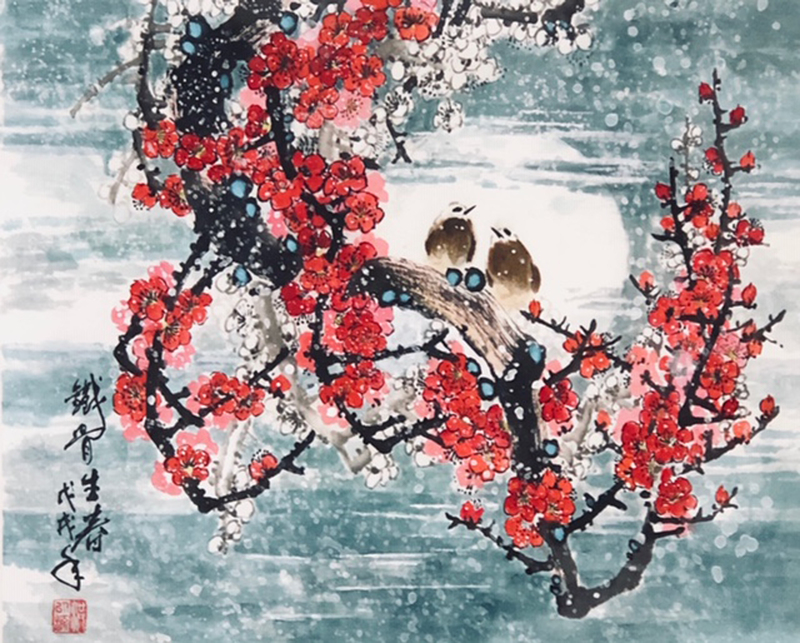 From representations of animal and plant life to landscapes and earthworks, art has been a means by which humans express their awe of, communion with, dependence on, and isolation from nature. Please submit work which reflects or represents your relationship with or feelings about wildlife, plants, natural environments, or landscapes. Maximum Size: 36″ wide x 60″ high. Notification to artists on or before Saturday, 3/9/19. 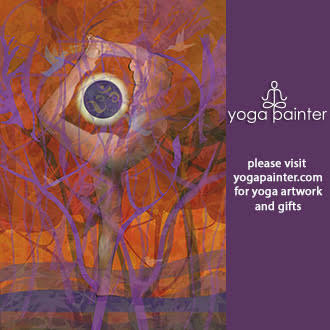 Hand delivery of artwork: Friday & Saturday, 3/15 & 3/16/19 from NOON to 5 PM. Opening reception: Friday, 3/22/19, 5 – 8 PM. Art Pickup: Friday & Saturday 4/12 & 4/13/19, NOON to 5 PM. 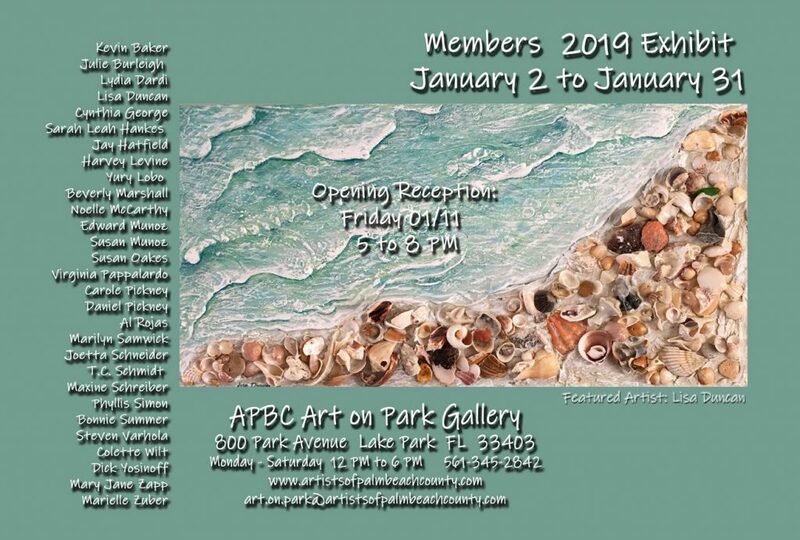 If you wish to join APBC or renew your membership if it has lapsed, please go to www.artistsofpalmbeachcounty.org and click on “Become a Member” BEFORE you enter the exhibit. Applications and fee payments are to be sent to or dropped off at the gallery. Please use the form below. Once you have completed your application, email up to 3 jpg images of your work no larger than 3 MB each to artistsofpbc@gmail.com. Images should include your last name and image title. In the subject of your email put “The Natural World.” Your email should include your name and phone number plus the title, medium, size (h x w), and price for each submitted work as on the application entry form below. IMPORTANT: Members will receive 75% of the gross sale. Non-Members will receive 65% of the gross sale. Please price your work accordingly. Juried by the Art on Park Gallery Management Committee. 1) No late entries accepted. 2) Original ideas only – no copying of works. 3) Please do not submit work that is not ready to hang. 4) Entry fees are not refundable. 5) The decision of the jurors is final. 6) Make sure the emailed jpg images match the names listed on the entry form. 7) We recommend paper media be covered with Plexiglas. 8) Unframed oils and acrylics must be finished on all sides – no staples showing. 9) No damaged frames or mats; mats must be clean. 10) All installation methods, such as wire attached to frames, must be secure. All 2D pieces MUST be wired on the back. 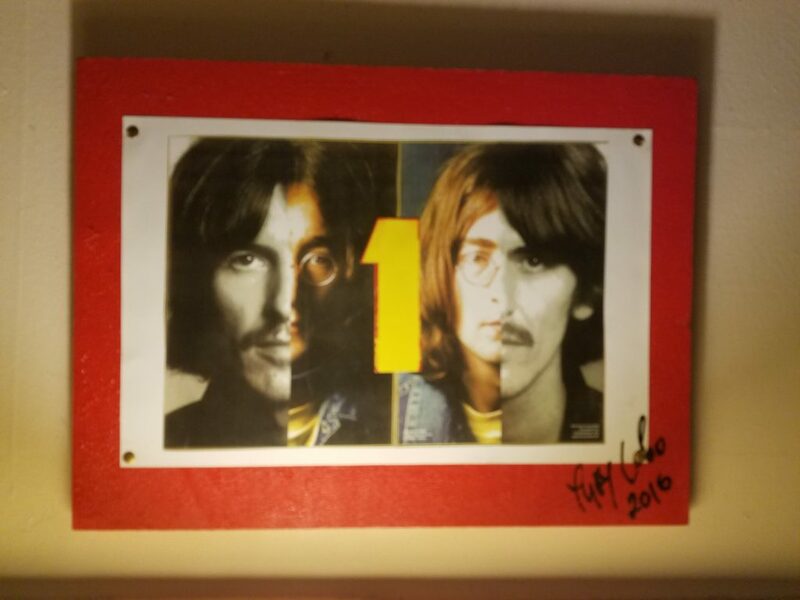 11) All entries must be labeled on the back of the work, base of sculpture, or somehow attached to artwork with artist name, title of work, medium, size, and price. 12) APBC, Inc. carries liability insurance for the Art on Park Gallery which does not extend to your artwork. APBC, Inc. will do its best to safeguard against theft, loss, breakage, or other damage, but will not be financially responsible for reimbursement of lost or damaged work. WAIVER OF LIABILITY: The undersigned hereby agrees to release and discharge APBC, its directors and members from any responsibility for damage or loss of any kind, on all works submitted for the “The Natural World” Exhibition. 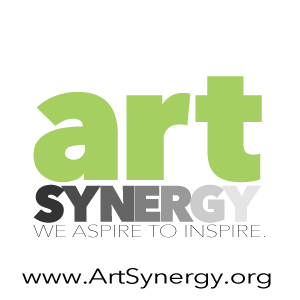 Open Call For Art Entries At Art On Park Gallery, All Media Including Ceramic, Drawing, Fiber/Textile, Glass, Jewelry, Mixed Media, Metal, Oil, Pastel, Acrylic, Photography, Printmaking, Watercolor, Wood. Cash Prizes. Deadline Is January 30. 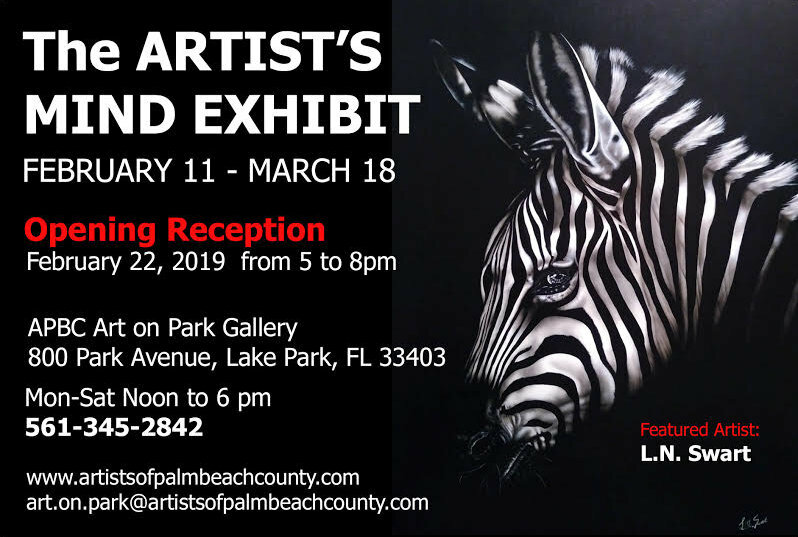 The Artists of Palm Beach County and the Art on Park Gallery are calling for an all media art exhibit, “The Artist’s Mind”. Entries are due January 30, with a Free, Public Opening Reception on Friday, February 22. This is open to members and non-members, with cash prizes. Show us what exemplifies the spirit or philosophy of your work! The Rickie Report shares the details here. THE ARTIST’S MIND is a call to artists both APBC members and non-members alike for an exhibit of original work of any subject, 2D and 3D welcomed in all media including ceramic, drawing, fiber/textile, glass, jewelry, mixed media, metal, oil, pastel, acrylic, photography, printmaking, watercolor, and wood. Maximum Size: 36″ wide x 60″ high. Please submit work which exemplifies the spirit or overall philosophy of your art. No explicit sexual or political work accepted. Notification to artists on or before Saturday, 2/2/19. Hand delivery of artwork: Friday & Saturday, 2/8 & 2/9/19 from NOON to 5 PM. Opening reception: Friday, 2/22/19, 5 – 8 PM. 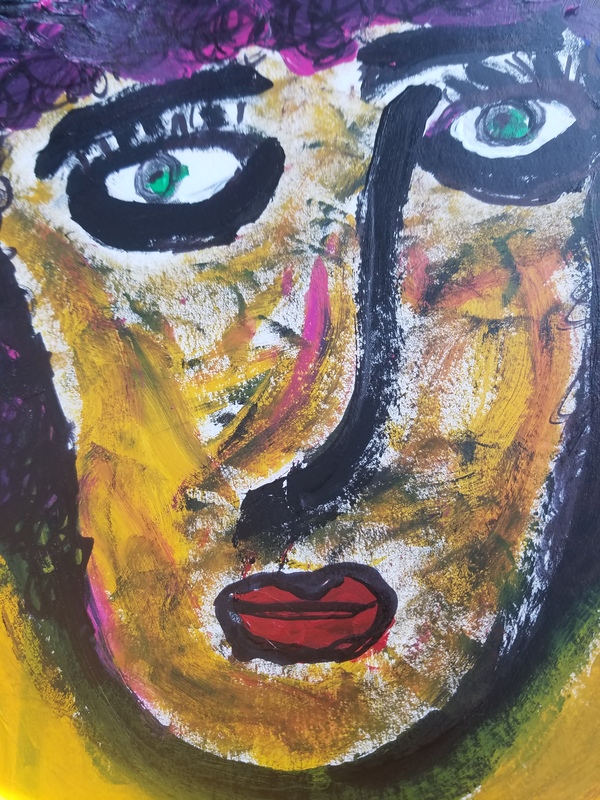 Art Pickup: Friday & Saturday 3/15 & 3/16/19, NOON to 5 PM. SUBMISSION FEES: $15 for APBC Members, $35 for Non-members. Applications and fee payments are to be sent to or dropped off at the gallery. to 3 jpg images of your work no larger than 3 MB each to artistsofpbc@gmail.com. call the Gallery for help, 561-345-2842. 7) All paper media must be glazed with Plexiglas. pieces MUST be wired on the back. 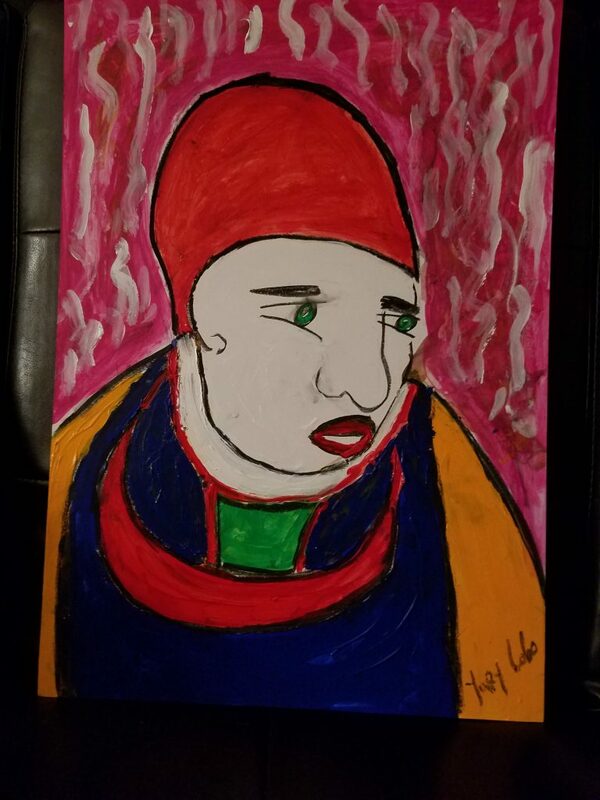 attached to artwork with artist name, title of work, medium, size, and price. Or drop off during gallery hours (Mon. – Sat. noon to 5 pm). kind, on all works submitted for the “The Artist’s Mind” Exhibition. Art On Park Gallery, home of the Artists of Palm Beach County announces the “Members 2019 Exhibit”, with a free, Opening Reception on Friday, January 11th. The “Art By The Inch” Scholarship FUNdraising Event will continue. ALL monies raised will benefit graduating High School Seniors for College/University Level Art Programs. A Student Exhibit will take place in the Spring, 2019. Art lovers will enjoy, art students will be aided, and artists will benefit! This is a win-win-win! The Rickie Report shares the details here. Beth Baker, Norman Berman, Marsha Bhagwansingh, BJ Collister, Lydia Dardi, Ken Dempsey, Christine Fogel, Elsebeth Lauge Grue, Caren Hackman, Jean Hutchison, Jennifer Isham, Joan Lagoulis, Frances Lynn, Sarah Mayo, Noelle McCarthy, Pamela Achenson Myers, John Vincent Palozzi, Ginny Pappalardo, Daniel Remmel, Barbara Roehl, Jeannie Rossi, Thomas Rowe, T. C. Schmidt, Maxine Schreiber, Judith Smith and Mary Jane Zapp. ALL money collected from these pieces will go toward the scholarship fund. Free, All are welcome. Bring one piece of your original, recent art to show and tell. Light refreshments will be served. Art On Park is a gallery of local artists of all disciplines bringing you original art in a variety of mediums and price points. 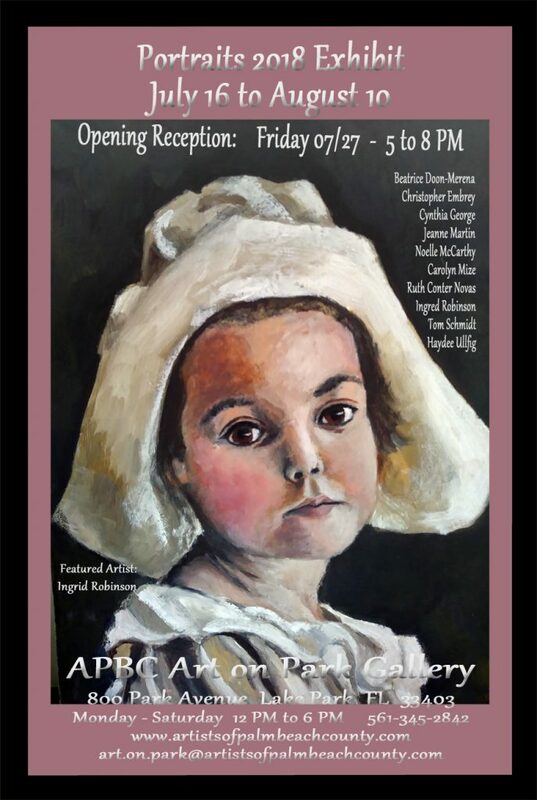 The APBC Art On Park Gallery located in Lake Park announces its “Art By The Inch” Scholarship FUNdraising Event on Friday, December 14. It will take place during the Opening Reception of the “Absolutely Abstract 2018” Exhibit. The monies raised will benefit graduating High School Seniors for College/University Level Art Programs. A Student Exhibit will take place in the Spring, 2019. The Rickie Report shares the details and urges everyone to stop by! This is a win-win-win! Art lovers will benefit, art students will be aided, and artists will be rewarded! Kudos to Artists of Palm beach County for this event! One hundred percent of the monies collected from these pieces will go toward the scholarship fund. In addition to these works there will be displayed a multitude of abstract art by various artists in different mediums, which will also be for purchase. 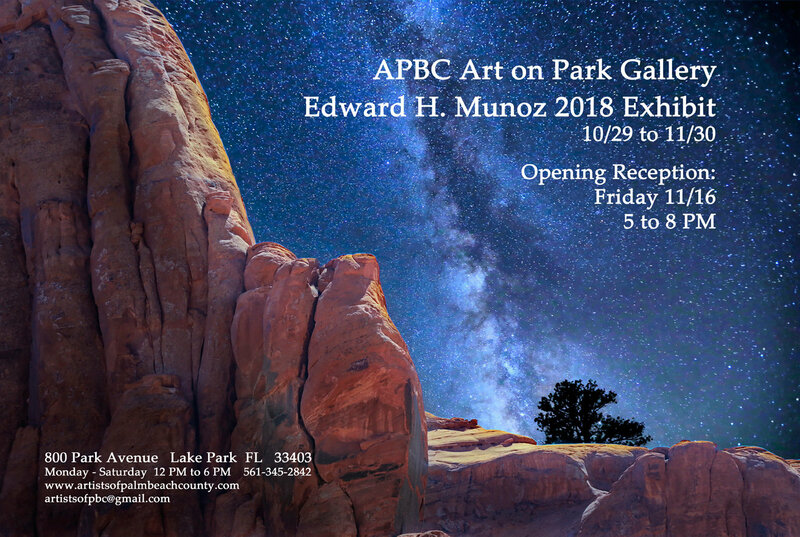 Art on Park Gallery announces a special art exhibit featuring Edward H. Munoz, with an Opening Reception on Friday, November 16. Included in this article is a Call for “Absolutely Abstract 2018”. Art lovers mark your calendars for that Opening Reception on Friday, December 14. 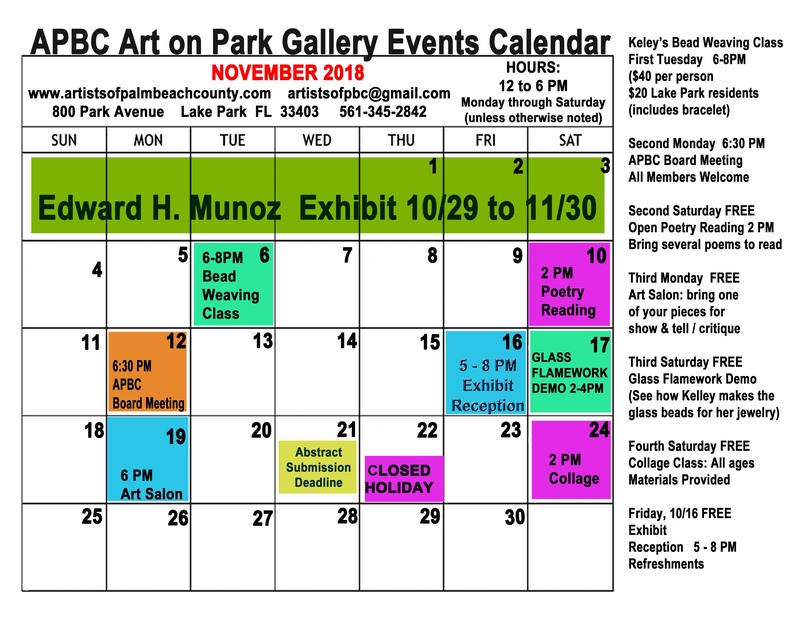 Hosted by the Artists of Palm Beach County, there are ongoing classes, free events, and workshops. The Rickie Report shares all of the details here about all of them, plus a special FUNdraiser for Student art scholarships! “ART BY THE INCH” FUNdraiser! 6 X 6 inches $50. 8 X 8 inches $75. 12 X 12 inches $100. They are being donated by APBC members. 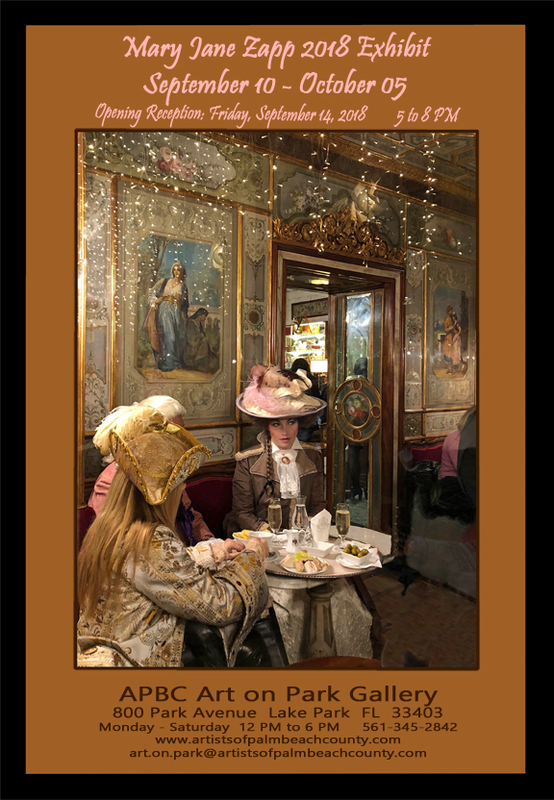 APBC Art on Park Gallery Presents a Call for ” PHOTOGRAPHY 2018 Exhibit”, celebrating artists who are photographers and residents of Palm Beach County. The artistry of Mary Jane Zapp is being highlighted now through October 10th, with a Free Opening Reception on Friday, September 14th. 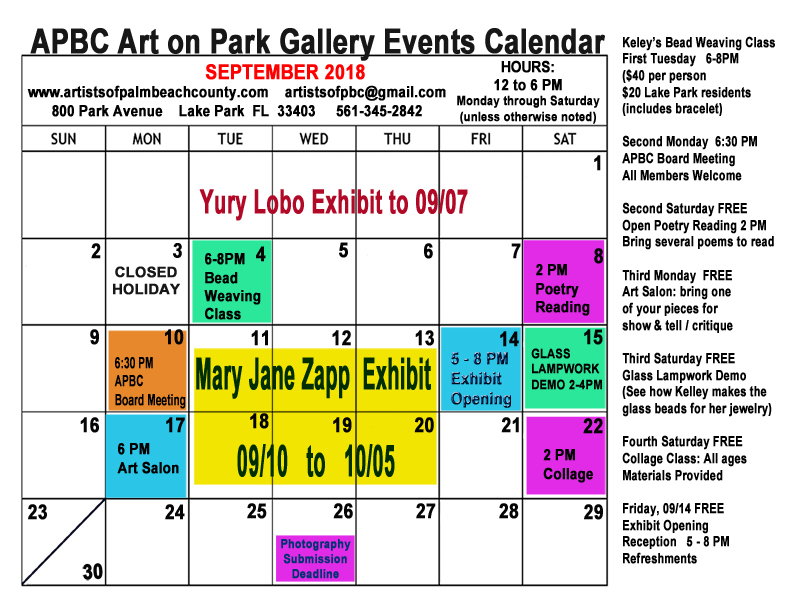 In addition, there are free classes, workshops and other events happening at this busy Lake Park gallery! The Rickie Report shares the details here. This Call for artists is open to non-members. Submissions should be a photograph of any subject in black & white or color printed on any surface. No explicitly political or sexual images will be accepted. NO computer generated or altered work allowed (cropping is allowed). Open to all artists who live in Palm Beach County. Work previously displayed at APBC Art on Park Gallery is not allowed. Please do not submit work that will not be ready to hang by the drop off date. Non Members will receive 65% of the gross sale. Please price your work accordingly. IF YOU ARE A MEMBER, A PAST MEMBER, OR A NON-MEMBER WHO HAS ENTERED AN EXHIBIT IN THE PAST, LOG IN FIRST BEFORE YOU TRY TO ENTER. If you want to join APBC please follow the “Become a Member” link BEFORE you enter the exhibit. Or you can renew your membership if it has lapsed. After you pay the membership fee ($50 for one year), please make sure you complete the registration process by following the provided links and email instructions to fill in your user name/password and contact details. Go to the “APBC Exhibitions” tab on the left side column of the Home page. Go to the PHOTOGRAPHY 2018 event and click on the provided link. You should have your images ready to upload (JPEG format only, no larger than 3 MB each). After you have chosen ALL your images click the UPLOAD button. You will then be asked to fill in the name, medium, size and price of each image. When this is complete you have reached the final step. Click the button. You should receive an email telling you of the successful submission. 01) Work previously displayed in Art on Park Gallery is not allowed. 03) Only original works will be accepted. No giclees of original work unless the original is a digital image. 04) Maximum Size: 60″ wide x 60″ high. 05) No late entries accepted. 06) Entry fees are not refundable. 07) The decision of the jurors is final. 08) Images of works must be submitted to be juried in an electronic JPG format, no larger than 3MB each, via the link on the APBC.org website. File names should contain the name of the work. Make sure the file names match the names listed on the entry form. 09) Any required entry fees must be paid before submissions will be accepted. 10) Unframed pieces in any medium must be finished on all sides – no staples showing. 11) No damaged frames or mats; mats must be clean. 12) All installation methods, such as wire attached to frames, must be secure. All 2D pieces MUST be wired on the back. 13) All entries must be labeled on the back of the work, base of sculpture, or somehow attached to artwork with artist name and title of work. 14) Members will receive 75% of the gross sale. Non-Members will receive 65% of the gross sale. Please price your work accordingly. 15) APBC, Inc. carries liability insurance for the Art on Park Gallery which does not extend to your artwork. APBC, Inc. will do its best to safeguard against theft, loss, breakage, or other damage, but will not be financially responsible for reimbursement of lost or damaged work.16) No explicitly political or sexual images will be accepted. Classes, Free Events, Poetry, Collage, Drawing…So Much More! Art on Park Gallery, home of Artists of Palm Beach County, presents new artworks by Yury Lobo. He was raised in a small rural town in Russia, where the signs “No Trespassing” hung on every door. By pure chance, at the age of 12, Yury and his mother attended the first American Exhibition in Moscow. 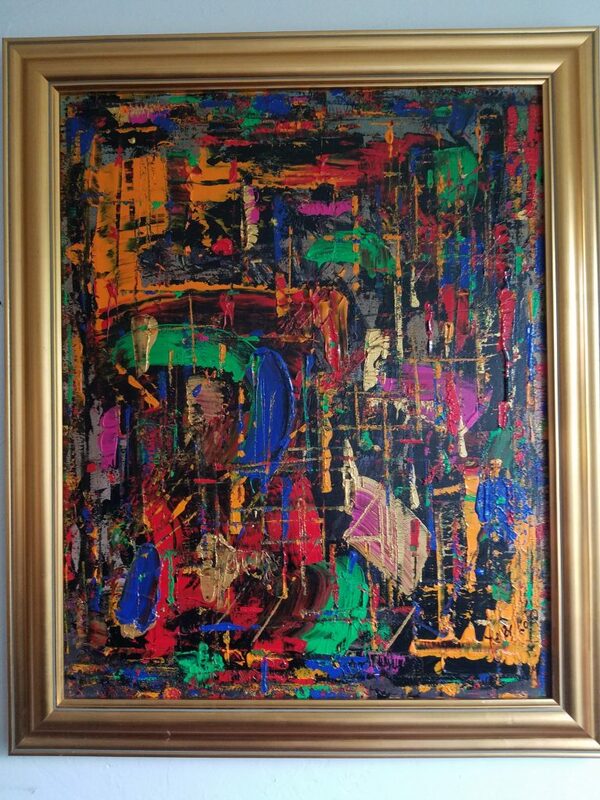 He was particularly struck by the painting, “Cathedral” by American abstract expressionist, Jackson Pollock. That day changed the trajectory of his life forever! Pushing boundaries, Yury found freedom in the United States, being fully opened to new heights of artistic expression. The Rickie Report shares details of his newest exhibit at Art on Park Gallery in Lake Park. Meet the artist on Friday, August 24th at a free, opening reception. We also list classes, free workshops and other events available at Art On Park Gallery. Yury created a few paintings for close friends and family, trusting his inner instincts. Back then, in the USSR he didn’t have the courage to paint and share his passion for abstract expressionism and collage publicly. Keeping his painting mostly to himself, he pursued a career that was more economically sound. He received a Masters degree in German and English, studied the history of art and worked as a licensed multilingual guide at the majors art museums in the former USSR. He became a journalist, interpreter, German teacher, TV script writer. Having fled the USSR in 1991 for political reasons, Yury first established himself in Miami and pursued his journalism career, working for several Russian-American newspapers. Later, he started one of his own, but sold it in 2007 and moved to West Palm Beach, where he continues his career as a German teacher and now a contemporary artist. The freedom of expression in America has motivated and inspired Yury to fulfill the dream of his youth – sharing his creative side publicly. His artistic name, “Lobo” is a shortened form of his long Ukrainian last name, “Slobodenyuk”, which translates to ” a free man”. “Lobo” means “wolf”, the symbol of the tireless will, yearning for freedom. Yury tells The Rickie Report, ” My fellow countryman, Kasimir Malevich once said, ‘Comrades, arise, free yourselves from the tyranny of objects!’ In this sense, I, like him, consider myself an abstract artist and a revolutionary. My battle cry is ‘Stop copying the world! Create a new one!’ Whoever is afraid of bright colors is afraid of life, which I am not”. Furthermore, Yuri confesses, ” I know it sounds nuts, but I consider myself a kind of modern reincarnation of the late Jackson Pollock who, in his own words was a “cowboy” painter. Like him, I’m painting “from the hip”, creating huge abstract compositions within minutes, using brusque wild strokes of bold colors. Some of my colleagues (part joking, part serious) are dubbing me “Jack The Whipper” for whipping that canvas with paint instead of dripping it as Jack The Dripper (Jackson Pollock) did”. Yury goes on to explain, “In the art of collage, I represent a completely different point of view. My slightly distorted collages are pretty close to reality and filled with hidden ironies and sometimes tragic messages. Being a history buff, I can’t help but act as the mocking bird, laughing at the human inability to learn from history…which of course sees that such ignorance is doomed to repeat itself. Every collage is a “time capsule” with a message to future generations. A true artist is about the inner energy which he or she tunnels to the public through the art. If there is no reaction at the receiving end, then the energy was either poor or lost in artistic translation”. 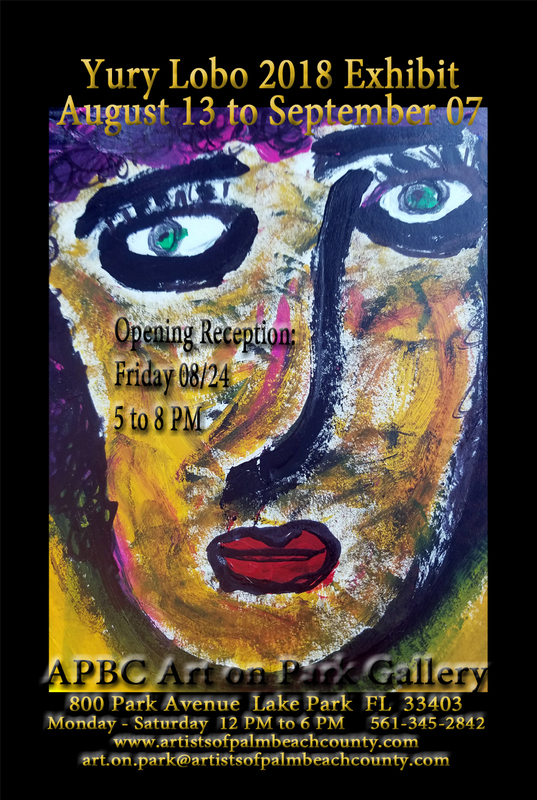 APBC Art on Park Gallery Presents ” DRAWING 2018 Exhibit”, celebrating artists who draw & produce pulled prints. Artists must be residents of Palm Beach County. Submissions should be a drawing of any subject in dry media, black & white or color; or a pulled print. Ink pens and felt tip markers are acceptable. NO computer generated work allowed. Artist Deadline is August 29th. The Rickie Report shares the details here. This Call for artists is open to non-members. through midnight (Eastern Time) on Wednesday August 29th, 2018. Accepted artists will be notified by email on or before Saturday, September 1st, 2018. 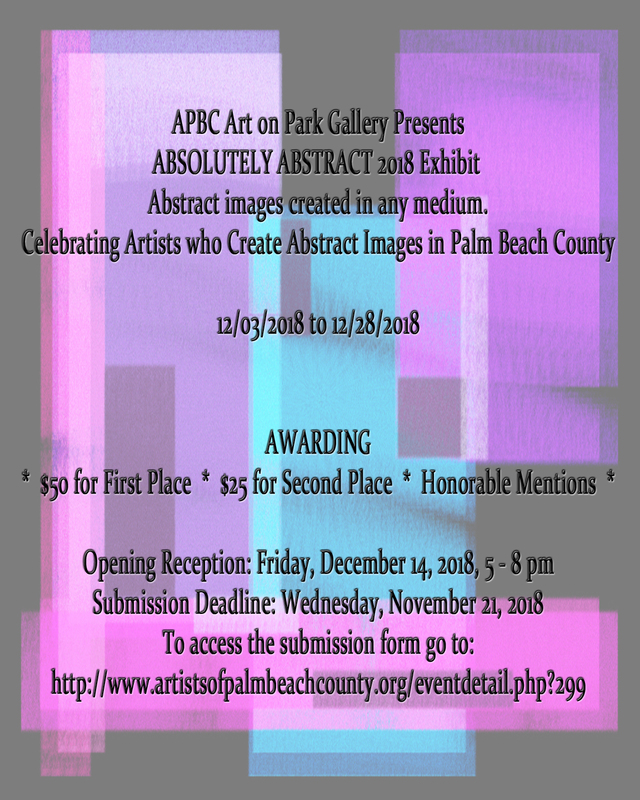 Submissions and payments to be sent in electronically via www.artistsofpalmbeachcounty.org. Go to the “APBC Exhibitions” tab on the left side column of the Home page. Go to the DRAWING 2018 event and click on the provided link. 13) All entries must be labeled on the back of the work, base of sculpture, or somehow attached to artwork with artist name and title of work. 14) Members will receive 75% of the gross sale. Non-Members will receive 65% of the gross sale. Please price your work accordingly. 15) APBC, Inc. carries liability insurance for the Art on Park Gallery which does not extend to your artwork. APBC, Inc. will do its best to safeguard against theft, loss, breakage, or other damage, but will not be financially responsible for reimbursement of lost or damaged work. Art On Park Gallery’s “Portraits, 2018” exhibit opens Friday, July 27th, with a free, public reception. Welcome Featured Artist, Ingrid Robinson, meet all of the artists, and mingle! Stop by for classes in jewelry making and drawing. 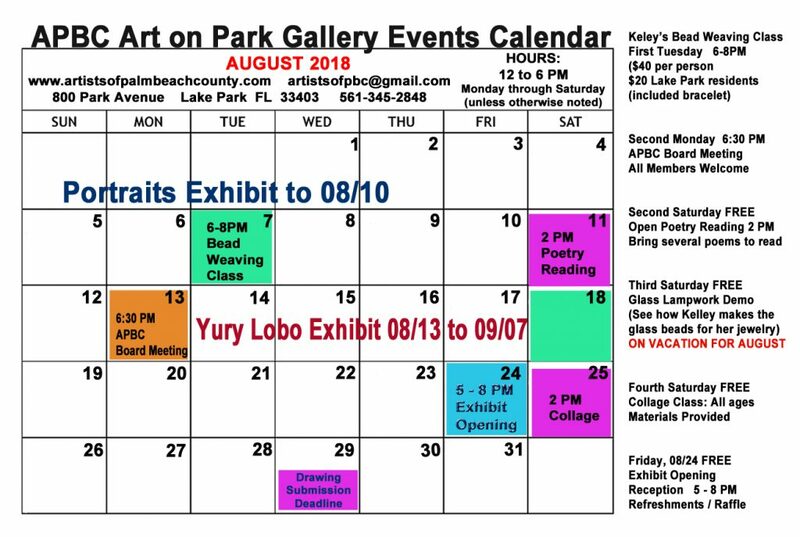 Don’t miss the free poetry readings, collage class, Art Salon, and lampwork jewelry demonstration in this Lake Park Gallery featuring over 100 Palm Beach County resident artists. The Rickie Report shares the details. CLASSES, FREE EVENTS, AND MORE!